Birds standing in the water, all facing the sun. There's always something curious when you turn a corner and find a large contingent of animals all doing the exact same thing in near silence. 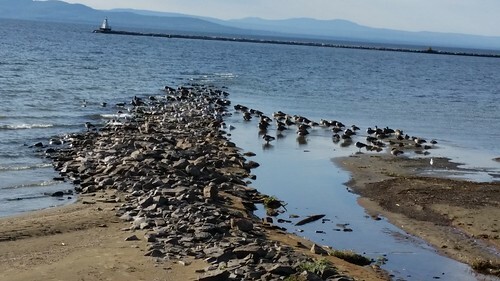 Thus was the case as I came around a bend in a bike path and saw all these birds just standing in the water, sand, and rocks staring directly at the sun. I felt like I was disturbing their afternoon contemplations or had tresspassed upon some sacred session among the birds. They stood their in silent contemplation looking at the sun as it approached the horizon but was still hours away. I wonder why they had chosen this spot and whether it was a group decision or did they just slowly accumulate here. Could this be a daily ritual--like going to Cheers--everyone knows what to expect and just meet there daily?